It's been a while since we've been to our local WalMart. It wasn't that fun for me anymore when they removed the fabric and craft area. 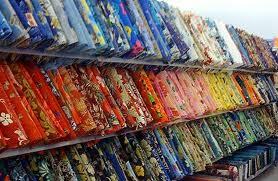 Today I went over to WalMart and saw some odds and end of fabrics at the end of their small craft aisle area. I looked at the different pieces and didn't like them. Then I turned to the right and there it was... I heard the music in my head. The fabric was back. They had 3 rows of fabric, sewing machines, notions and interfacing among other items. Now I know it's not the best quality fabric, but, it works well in a pinch for charity quilts and pillow cases. So, head to your local super WalMart that used to have a fabric area and see if your fabric area is back! Our Walmart never lost it's fabric department. We were one of very few that didn't. They did appear to change their quality of fabric and not for the better. I still do buy fabric at Walmarts but have to very careful when selecting it. I could never figure out how they were making more money on two rows of "paper party plates" instead of fabric?